Antioch Elementary School - Interaction with the musicians and instruments is an important facet of each performance. LAUREL HILL — Goldstein visited the students of Laurel Hill School Tuesday to share his musical gift. It was 8:15 a.m. in the cafeteria at Laurel Hill School. Students followed teachers to their seats. All of the children in attendance were fourth grade and below. Principal Lee Martello spoke to the children first, making sure they gave all of their attention to Goldstein as he performed. “We want to be Hobos in control,” Martello said. The performance began with Goldstein naming the parts of the piano and explaining how the instrument works. The students were quiet and attentive throughout Goldstein’s explanation, minus a few “oohs” and “ahhs” from some of the children. 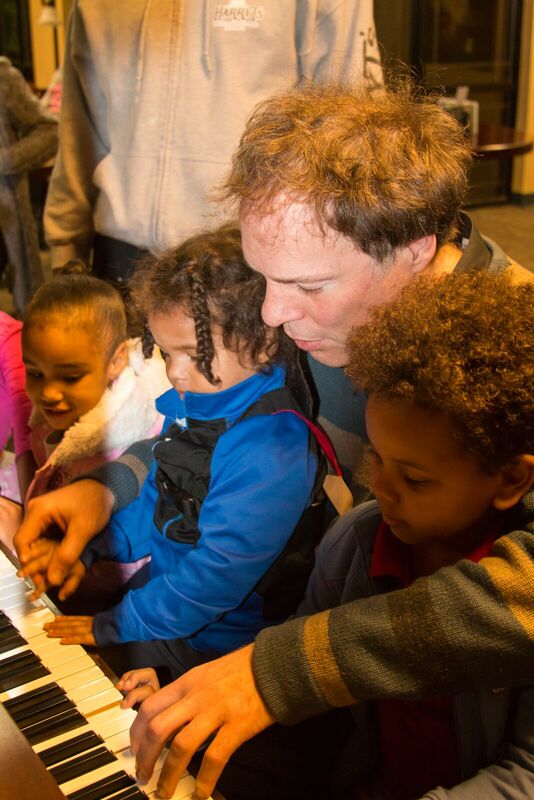 Goldstein made his performance an interactive experience for the children. After each piece, he would tell a story or ask the kids what they thought the composer was trying to portray. 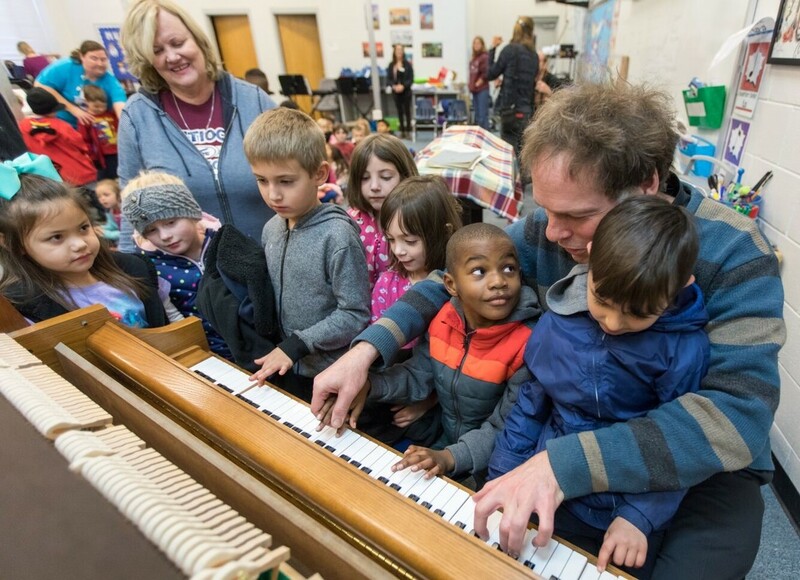 In between all three movements of Beethoven’s “Sonata,” commonly know as the “Moonlight Sonata,” Goldstein asked the kids to figure out the story behind each movement. Goldstein completed his performance with a “jazzy” piece by Leonard Bernstein. ​NICEVILLE — The Emerald Coast Music Alliance is bringing art back to the Emerald Coast, one concert at a time.The organization, which formed in January 2017, has a goal of making classical music accessible to populations who might not otherwise get to hear it, said Dr. Bob Morell, a founding member and coordinator of the alliance. 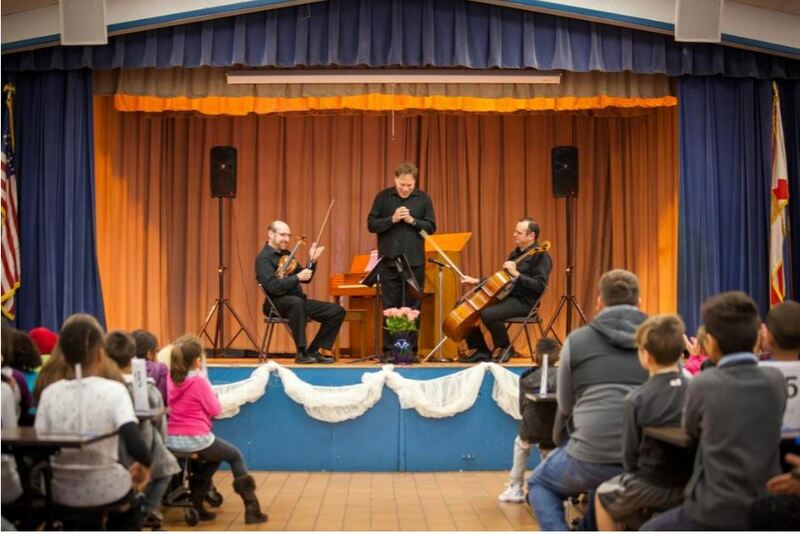 The first annual Emerald Coast Music Alliance Festival was declared a resounding success after world-renowned pianist Alon Goldstein and Northwest Florida Symphony Orchestra musicians, Leonid Yankovskiy (violin) and Boyan Bonev (cello) entertained students with classical music recitals at five Okaloosa County schools and organizations. The festival was made possible by the newly formed Emerald Coast Music Alliance (ECMA) The inaugural festival culminated in a spectacular fund-raising reception and recital which was hosted by Edwin and Mary Watts as well as Robert and Venita Morell. Plans are underway to expand festival offerings throughout the Northwest Florida region. For more information about the Emerald Coast Music Alliance, please call the NWF State College Foundation at (850) 729-5357.